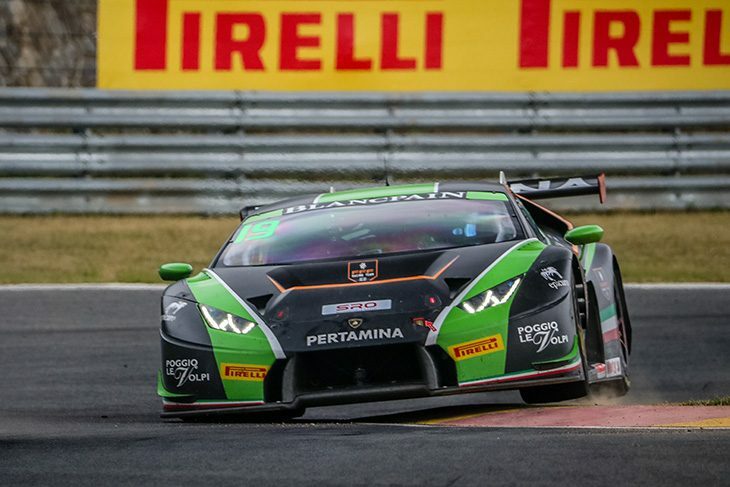 FFF Racing Team by ACM and Lamborghini capped their Blancpain GT Series Asia campaign at Ningbo earlier yesterday by wrapping up four GT3 titles. A third victory of 2018 was more than enough for Dennis Lind and Martin Kodric to claim the Overall and Silver Cup crowns, while Hiroshi Hamaguchi and Marco Mapelli’s Pro/Am success also helped the Chinese squad celebrate the Teams’ title. Respective penalties and retirements for the other overall championship protagonists, Nick Foster and Patric Niederhauser, helped Absolute Racing’s Audi driven by Anthony Liu and Alessio Picariello finish second overall and scoop the Pro/Am spoils, while Indigo Racing’s Roelof Bruins and Manual Metzger overcame their five-second pitstop success penalty to make it two podiums in as many races. Elsewhere, BMW Team Studie’s Sunako Jukuchou and Takayuki Kinoshita bounced back from yesterday’s disappointment of losing the GT4 Drivers’ title to claim their fifth win of the season ahead of newly-crowned champion Reinhold Renger and his GruppeM Racing co-driver Ryuichirou Ohtsuka. Ringo Chong and Alex Au’s Team iRace.Win Mercedes-AMG completed the podium. HubAuto Corsa’s victory owed much to Jono Lester avoiding the Turn 1 and 2 chaos that afflicted two pre-race championship contenders, as well as Martin Kodric and Dennis Lind’s 15s pitstop success penalty. Nico Bastian lined up on pole but was down to second as the field approached Turn 1 thanks to Lind’s lightning getaway from the outside of the front row. However, worse was to come for the #999 Mercedes-AMG, which was sent spinning into the gravel trap and retirement after being hit from behind by the #23 Nissan. The same incident also had ramifications at Turn 2 where Edoardo Liberati, following contact with Bastian, was spun around exiting the corner. The stricken KCMG Nissan was then tagged by Anthony Liu and Sandy Stuvik, both of whom retired as a result. 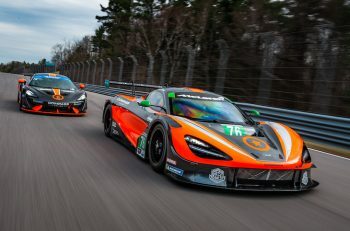 A lengthy Safety Car period was inevitably required, which, once racing resumed, ensured just seven minutes remained before the pit window opened. That left no time for Lind to build an advantage over Lester whose co-driver Foster emerged well clear after the stops. Absolute Racing’s Franky Cheng also avoided the lap one chaos to run third, which later became second when Martin Rump benefitted from FFF Racing’s slower pitstop. Indeed, Martin Kodric re-joined in the middle of the battle to determine the final podium place. Initially third, he would be shuffled down to seventh by the end of his out-lap as a result of each passing move further compromising track position. 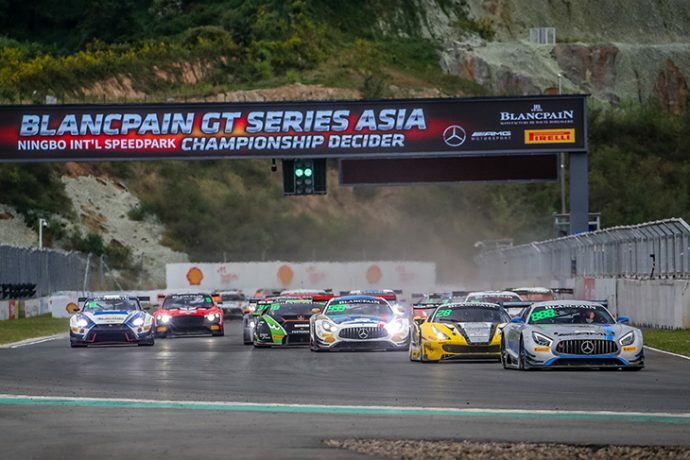 Adderly Fong, Mitch Gilbert, Aidan Read and Alex Yoong all initially played their part in a thrilling dice, but it was Indigo Racing’s Mercedes-AMG that seemingly came from nowhere to claim its maiden Blancpain GT Series Asia podium behind the Ferrari and Audi. Roelof Bruins was running ninth when the pit window opened after losing ground on the opening lap. 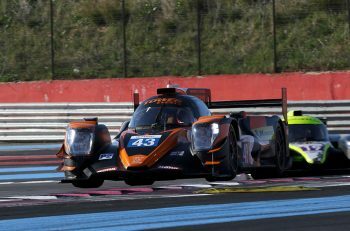 However, the team’s decision not to change tyres helped Manuel Metzger claw back some of the lost ground before also working his way from seventh to third. A late Safety Car period to recover a stranded GT4 Porsche helped the German finish 2.3s behind Rump. Absolute Racing’s Fong and Andrew Kim were best of the Pro/Am crews in fourth thanks, in part, to the latter jumping from 12th to fifth in the opening stint. 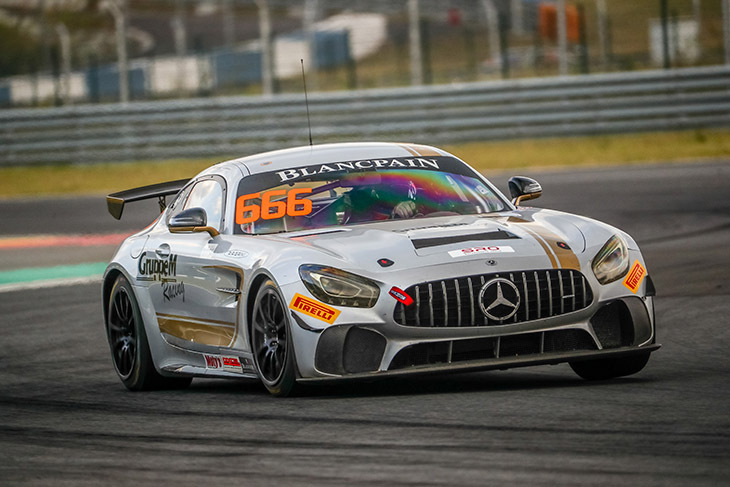 Kodric and Lind inherited fifth post-race from the #888 GruppeM Mercedes-AMG which was penalised 30s in lieu of a drive-through for overtaking under yellow flags, and the top-six was rounded out by OD Racing’s Gilbert and Aditya Patel who were also big winners during the lap one dust-up. Hiroshi Hamaguchi and Marco Mapelli extended their Pro/Am points lead with seventh overall, Tim Slade’s quick second stint helped HubAuto’s other Ferrari to finish eighth ahead of Craft-Bamboo’s remaining Porsche, and KCMG’s #18 Nissan completed the points scorers in 10th. 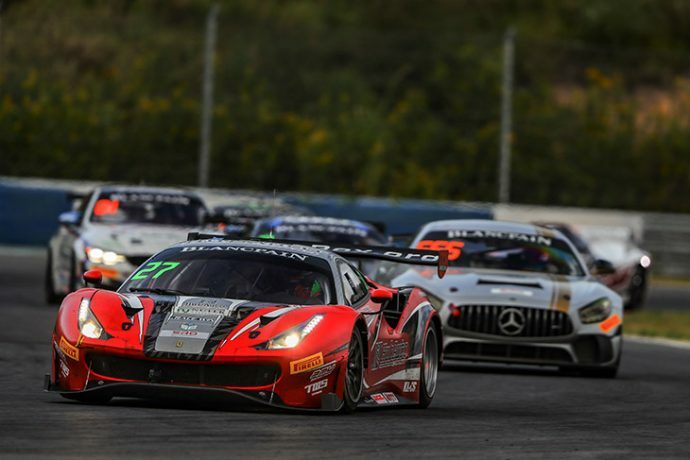 Dennis Lind and Martin Kodric ultimately ran out comfortable race and championship winners, but it could have been very different had separate issues not befallen their two remaining championship rivals during a tense final 60-minute race of the season at Ningbo. The #19 Lamborghini took the chequered flag 4.1s clear of Anthony Liu and Alessio Picariello’s Audi following Alexander Mattschull’s late retirement from a lead built on GruppeM co-driver Raffaele Marciello’s quick first stint. Indeed, the Italian led the opening 30 minutes from pole and set fastest lap, while HubAuto Corsa’s two Ferraris driven by Tim Slade and Nick Foster held station behind following an early Safety Car period triggered by the Craft-Bamboo Porsche and ARN Racing Ferrari colliding on lap one. The first significant development occurred just before the pit window opened when Patric Niederhauser’s championship-chasing GruppeM Mercedes-AMG retired from fourth place with broken rear suspension. 22 points behind with 25 to play for at the start of the race meant the Swiss had no choice but to win while hoping other results went his way. Instead, he would end the campaign third overall. The spotlight then shifted to Kodric who pitted from seventh at the first time of asking. Lind subsequently emerged right in front of Foster, who had delayed his own stop by two laps in an effort to make up some of the impending 15s pitstop success penalty he and Jono Lester were due to serve. Instead, the pair touched numerous times before the Australian peeled into the pits. Incredibly, Lester re-joined 16s ahead of the Lamborghini before immediately overtaking some of the slower Am drivers ahead. For a time the provisional order and points suggested a grandstand finish was in prospect, but HubAuto’s pitstop was soon under investigation and ultimately found to be 14.5s too fast. When the subsequent stop/go penalty was also served under time, which necessitated a second stop, Foster’s championship chances appeared well and truly over. By that point Lind had also picked his way through the GT3 Am contingent, which included a brave move around Liu for second place amongst traffic. First wasn’t necessary to secure the title, but that’s exactly where the Lamborghini finished after Mattschull’s 22s lead was wiped out by a late fuel issue that stranded the Mercedes-AMG. Liu, whose co-driver Picariello initially made up ground after starting eighth, held off a charging Roelof Bruins over the final laps to finish ahead of Indigo Racing’s Mercedes-AMG, which served an additional five seconds in the pits after also claiming a podium yesterday. 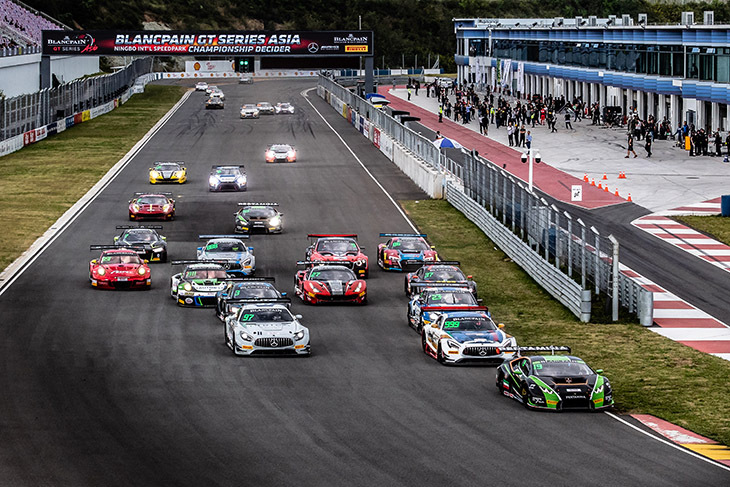 Franky Cheng and Martin Rump overcame their success penalty to end up fourth, Shaun Thong and Jordan Pepper fought through from last to fifth aboard Phoenix Racing Asia’s #6 Bentley, and Andrew Kim and Adderly Fong ensured all three Absolute Audis featured in the first half-dozen finishers. OD Racing’s Audi, the #23 KCMG Nissan and second Phoenix Racing Asia-run Bentley crossed the line nose-to-tail, while Lester recovered from HubAuto’s two stop-go penalties to salvage a point in 10th. Reinhold Renger was confirmed as the 2018 Blancpain GT Series Asia GT4 champion after the combination of victory and a penalty for his nearest championship rivals helped seal the crown with a race to spare. GruppeM’s Mercedes-AMG initially driven by Ryuichirou Ohtsuka remained close to race leader Sunako Jukuchou throughout the opening stint fully aware that the BMW Team Studie M4 would spend an additional 15s in the pits. Renger therefore duly inherited a comfortable lead after the stops, while Team iRace.Win’s Ringo Chong and Alex Au also moved up one place to second at Takayuki Kinoshita and Jukuchou’s expense. The late race Safety Car period initially threw Team Studie a lifeline. But when, during a post-race investigation, Kinoshita’s pass on Au was deemed to have taken place under yellow flags, there was no choice but to apply a 30s penalty in lieu of a drive-through. It also ensured that the Japanese pair ended the day 26 points behind Renger with only 25 available for victory tomorrow. 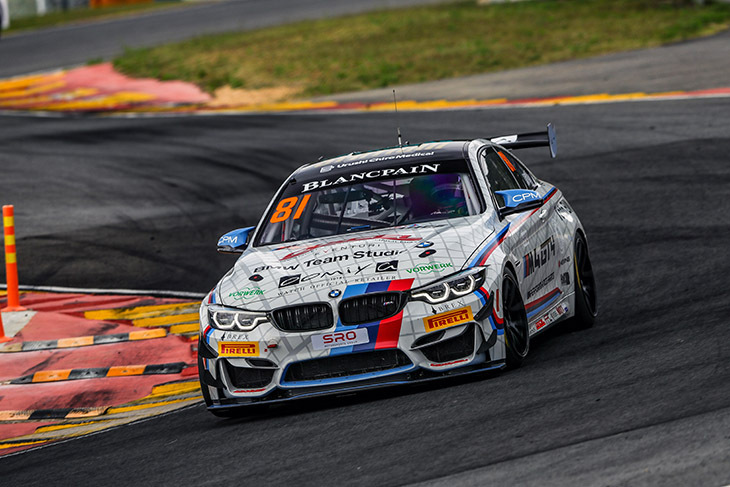 The final podium place thus went to M Motorsport’s Justin McMillan, who drove solo, while the championship’s first all-female crew comprising Naomi Zhang and Diana Rosario finished fourth. With the title decided on Saturday, all eyes were on the fight for second in the standings between BMW Team Studie pairing Sunako Jukuchou and Takayuki Kinoshita and Team iRace.Win’s Ringo Chong. The position ultimately went the Japanese duo’s way after claiming their fifth win of the year. In truth the lack of a pitstop penalty compared to their rivals always made Team Studie favourites, and especially so considering Kinoshita started on pole. From there he and Jukuchou were never troubled en route to a comfortable win. GruppeM’s Renger and co-driver Ryuichirou Ohtsuka added a second place to yesterday’s win by overhauling Chong and Alex Au, while Team Studie’s other BMW shared by Ken Urata and Max Chen finished fourth. The Taiwan Top Speed Porsche and Craft-Bamboo Mercedes-AMG completed the top-six.